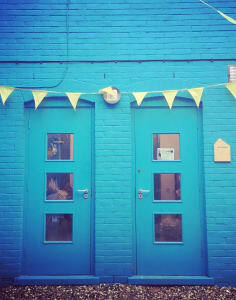 Studio1Ceramics is a workshop in the heart of Wood Green within Blue House Yard which is located a few minutes walk from Wood Green Station. 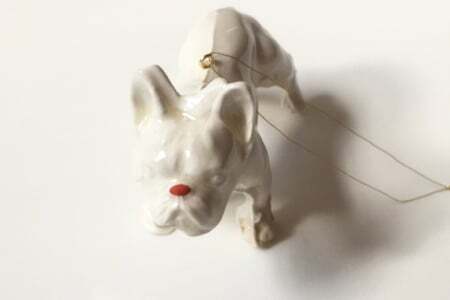 The classes are taught by Martha Todd RCA MA who has been a practicing ceramic artist and sculptor for 13 years and is currently researching for a PhD based on figurative sculpture in contemporary art. The studio is a beautiful bright space in which Martha teaches a series of clay workshops for all levels and abilities. The classes are small in size, ensuring that there is plenty of support for individual students. 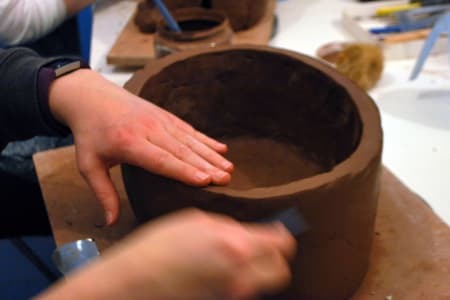 Martha teaches hand-building techniques in clay as well as surface decoration, glazing, mould-making as well as specialist classes. Prices include all materials and firings (which will include an initial bisque firing and a glaze firing). I had the best time with Martha, she really is a great teacher. I’ll definatly be back! Relaxed and fun class, great way to spend the evening. What a fabulous course. I had never done ceramics before and Martha explained what to do but encouraged us to explore our own creative ideas. Ut was a small group and a really relaxing way to spend Tuesday evenings - will definitely book again! Martha was a very good, skilled teacher, who created a relaxed, productive atmosphere. Explanations were clear, help was always available, and even in this very short course, everybody was able to produce interesting and pleasing work. Thanks. Very knowledgable and friendly. Lots of fun! We loved our taster session with Martha! She was very friendly and flexible to help us make what we wanted to. The studio is lovely too and we were left inspired! Thank you. I loved everything about the session - the duration and location was perfect. Martha is a great teacher and I think she did a fantastic job of introducing me to the basics of pottery. Would highly recommend! The Ceramics Taster Session was delightful I really enjoyed it, it was totally relaxing. I will definitely be going again. Martha was very welcoming and a great teacher. Absolutely loved my taster ceramics session! So much fun and really therapeutic. I took my mum for her birthday and we had such a good time. Thank you! We had such a good time in our taster session. Martha was a great tutor, and lovely company, with excellent taste in music! 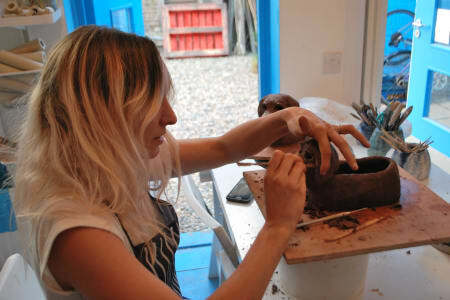 We were all inspired by the lovely pots and sculptures in the studio, and found the whole experience relaxing and fun. Two awesome hours of ceramics! This was a great taster session! I learnt a lot about making different types of pots and I understand the process a lot better. Martha was a great teacher and provided all the equipment needed. It's a fantastic class and I highly recommend it! Loved this class, you get the chance to do a really creative project whilst learning loads of different skills, and Martha is really open to you trying something experimental and different! I really enjoyed this day course as Martha gave us all hints and tips throughout the day as we progressed with our mini projects. The fact that we all managed to underglaze / slip our creations by the end of the day made it really satisfying And the lunch was delicious :) I will definitely be back. We really enjoyed our Saturday workshop with Martha. It doesn’t matter if you’re a complete beginner or more advanced, you are sure to enjoy this class! Martha is hugely talented and very knowledgeable - She gives you complete freedom to make whatever you wish, perfectly balanced with as much or as little guidance as you require. The classes are small in size, we were a group of five which meant we had lots of one to one guidance from Martha. Such a fun day, lots of interesting conversation and a delicious light lunch as well! If you’re in two minds about booking a class with Martha, I say go for it! It’s a chance to try something new! You’ll meet like minded people, switch off from the outside world and let your creativity flow - Seriously, what are you waiting for??!!! Go for it!!! The Saturday Workshop was great as it gave you time to properly get into making something a bit more complicated. It was a great way to spend a Saturday! I cannot tell you how much I have enjoyed weeknight ceramics classes @ studio1ceramics. It is so fulfilling to have some creative downtime during the week and Martha is so amazing at helping you bring your ideas to life. I am going to join this class again and probably will continue going for the foreseeable future!!!! Martha was awesome and very open to answer questions and give cool ideas for our new proyects! I learn about the glazes and colors, also how to make new shapes. I loved this course. Its a lovely little studio with a great, talented teacher. I will be booking more sessions. Really enjoyable and satisfying course - perfect if you want to learn the basics and complete your own projects. Less a formal step-by-step course, more about helping you to inspire/realise your own creative ideas. Enjoyed the course very much. Martha is very relaxed about what you might want to do, assuming it can realistically be achieved. The space is small and 5 is a bit of a squeeze, but all the people I was there with were nice and got on with their own pieces of work. My friend and I made very different things and Martha is good at throwing around ideas so you can get as close as you can to what you want to make. A good 4 evenings, and I probably could have done with one more week! Martha's a great tutor and the studio is such a lovely space. Booking onto another course right this minute!! I initially took a taster session with Martha, and enjoyed it so much I signed up for the evening ceramics course! Martha is an awesome teacher with incredible patience. She provides as much (or as little) guidance as you need, and is willing to work with the ideas you bring. It was a joy to spend evenings learning and creating at studio1ceramics! 2 weeks into the 4 weeks course and I've already decided to book onto another one. Love it - great guidance with an opportunity to create your own thing. My second ceramics course with Martha - think I'll be booking a third!! She's a great teacher and the space is so lovely. Would really recommend. Lots of advice on how to make my ideas come to life, and so many glazes etc to choose from!! I just can’t stop making ceramics!! Thank you, Martha for the two amazing, relaxed courses. Will definitely be attending again in autumn. Super fun class with Martha - great way to learn various ceramics techniques. I love these classes! Martha is a great teacher - very calm, experienced and knowledgable. I find the classes very therapeutic and I love the fact it is always a small class (5 ppl max) meaning Martha has a lot of time for each of us. I’ve been going on and off since January and will continue going for a long time. I'm almost embarrassed to leave another review as this is my 3rd course with Martha!! The fact that I've booked a 4-week course 3 times should be testament enough to just how great this is. If you see a space on one of her courses - book it quick!! Just love coming here. A little haven in Wood Green. You learn as you go along, get help when you ask for it, meet nice people etc. And get more ideas of what to do which makes you wanna come back for another month! Great atmosphere, great teacher. Hope to go to more classes. Martha is a wonderful teacher. I thoroughly enjoyed working in her inviting studio and spending the time learning hand-building techniques. The 2 hours just fly by. This was a great course. Really good value too. Martha is a patient and generous teacher and I think most of our class is coming back to book more classes. The venue was nice with lots of work around to inspire. Definitely signing up again in the future. It’s so lovely to spend a weekday evening getting creative after a long week at work. The classes are small and super sociable. Martha will help you create your ideas with clay in this relaxing environment. 100% recommend this course to anyone! I have been attending these classes since January and I love them! Martha is such a brilliant teacher with such creative ideas. I find the classes very therapeutic and can’t wait to sign up again in December! It is a really small class, which is nice as you get the help you need. Is really fun class and therapeutic. I just love Martha's courses. From never having done any ceramics, I've found that I really like it! With Martha's help, this course is really something for all abilities. I can't recommend it highly enough. These are brilliant classes, perfect for total beginners or anyone with experience. Studio1 is a lovely cosy studio close to Wood Green tube station. Martha goes above and beyond to make everyone welcome and to help them to achieve their ideas. I’ve learnt so much. I’ve been to several courses and will definitely be booking again! Chance to learn something new in a very lovely relaxed atmosphere. Fantastic class and a fun activity. Martha is a great teacher. Martha is a fantastic teacher with a lovely sense of humour. I learnt so much in just 4 weeks. The whole experience was an oasis of calm in an otherwise hectic world. I found my bliss. Martha is a brilliant teacher and helps you develop! Just so addictive and great for everyone, at any level. Martha is great at helping you progress. Coming to learn pottery here has become my little haven. Love it so much and can see I am improving. Wonderful teacher and it's great meeting lovely people. I came with my two sons who are 7 and 3. My oldest is very proud of his Cheetah and his Eagle and he'd taken it to school for 'show and tell' and he's got some lovely feedback from his classmates. I'm quite happy with my plant pot, so is the Aloe Vera which now resides. Martha was great with the kids, definitely would go again for a family session. Martha is a fantastic tutor. Always there to help and assist and her knowledge and experience with clay is so golden. She is also great fun! I really enjoyed my taster class and looking forward to working with her when I book my next sculpture class. Friendly, open minded teaching. Made a great pot with coiling technique and had a great time. If you are looking for something relaxed and fun then the introductory session is perfect! Great taster course, has definitely whetted my appetite. Nice small group size. A great introduction to ceramics! Martha was really friendly, her studio is a lovely relaxed place to enjoy learning about ceramics. I was really pleased with what I learned and will definitely be going back to try my hand at a few new designs! This taster session was the perfect course! It was the right amount of time and the right side. 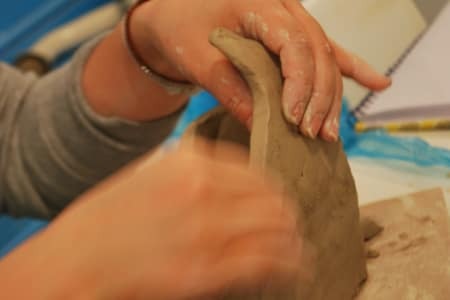 I felt I got a really good introduction to the techniques used, the types of clay, the different tools and what they can be used for as well as a taster into how to decorate the pots. It made me want to book onto a full course. Getting to make not one, but two pots was a bonus. Can't wait to pick them up! Super evening with Martha and others - the time flew by. We made two pots, using two different techniques, as well as learning about glazing and finishing, and were able to decorate the pots ready for firing. Martha is lovely, very friendly and very supportive of absolute beginners as well as those with some experience. Highly recommended. It was great! Martha was really helpful - with only two of us in the class it was such great value. We were able to work at our own pace and I feel I learned loads. I will definitely be going back! Really useful and engaging fun session. It was really great. Everything was very clear and relaxed. It certainly made me want to come back for more sessions - and if I can find a clear time I will book in for a course for definite. The studio is in a very nice place. Martha is very cheerful and patience. Would definitely recommend to my friends. It was a small space, but fit 5 comfortably. Really enjoyed my session and getting hands on with clay. I have used a wheel before but this was the first time I have used clay in this way. Definitely would recommend this class - and I will be attending again! Really enjoyed the session. Was really laid back and fun, and Martha was very knowledgeable and helpful! Would definitely recommend. My taster session at Studio 1 was brilliant - Martha is so knowledgeable and friendly, she was happy to cater to all levels and ideas. Would definitely recommend, I'll be back for the 4 week course! I attended a beginner's class last night and it was very enjoyable. It was a small group, we were shown basic techniques. People were friendly and the tutor was knowledgeable, relaxed and even made us a hot drink! I am definitely going to be booking more sessions for January and February. I love this class, the tutor is very supportive of self creativity and creates a relaxed atmosphere. The Taster Session is a really good way to try out ceramics. It does make you want to come back for a full course! I highly recommend this class. I really enjoyed the taster session last week, so I have already booked another session. Martha was an excellent teacher and the atmosphere of the class was friendly and relaxed. Highly recommend to anyone interested in making their own ceramics. Friendly tutor and participants and freedom to make what your want. I have now been to 4 sessions since November and just booked for a four week course to learn more about techniques and glazing. With only spaces for 5 people you get a lot of help if you need it. Really enjoyable relaxing session, was so pleased to be able to make two things to take home. Took place in such a lovely location too.